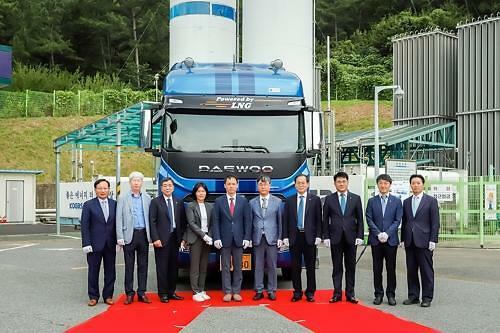 SEOUL -- A new eco-friendly truck powered by liquefied natural gas (LNG) made its debut in a project involving South Korea's state-run public natural gas company and a commercial vehicle subsidiary of India's Tata Motors. 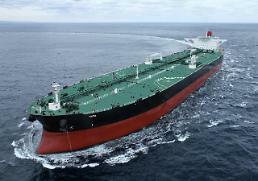 Korea Gas Corp. (KOGAS) said Friday that the LNG truck was delivered in a ceremony in the central city of Daejeon. It was the result of joint development with Tata Daewoo, the country's second-largest heavy commercial vehicle manufacturer owned by Tata Motors. The new truck used the frame of Tata Daewoo's commercial vehicle and a 400 hp gas engine of Italia's FPT. It can travel up to 1,000 kilometers on a single charge. The prototype will be tested to verify its economic efficiency, KOGAS said, adding LNG vehicles is a practical alternative to improve air quality. There are about 120,000 heavy diesel trucks in operation in South Korea. The gas company has unveiled a strategy for expanding LNG charging stations at ports and cargo terminals. Compared to conventional fuels, LNG is a proven commercial solution to meet ever-tightening emissions requirements. In line with the government's new energy roadmap to increase the use of renewable energy, KOGAS has promised to expand its natural gas capacity and infrastructure for clean energy sources.